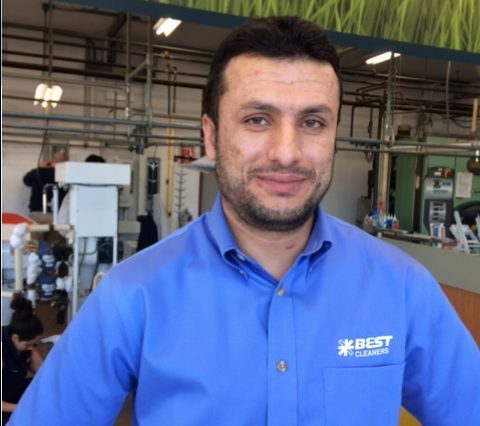 We would like to introduce you to Muhammad “Sabir” Barakzi, the tailor at out Rocky Hill location. Sabir, as he’s known to all, was born in Afghanistan. He became interested in sewing at the age of 14 after watching the tailors in the local shop close to his home. Sabir was eager to learn the business. He spoke with the owner of the shop who was willing to train him in the fine art of tailoring and sewing. Once Sabir’s training was complete, he was hired on full time and he worked at the shop for a total of 10 years. Sabir loved his job but he was ready for a change. He decided to relocate to Pakistan from Afghanistan and was able to find work for another tailoring shop. Pakistan was Sabir’s home for the next four years. When the opportunity to relocate to the United States came to him, he embraced it. We are lucky he ended up in Connecticut, and more specifically at Best Cleaners. Sabir is very talented and our customers love him. If you’re in Rocky Hill, please make sure to stop in and say hello! SIGN UP FOR OUR NEWSLETTER AND RECEIVE COUPONS! All Rights Reserved | Web design + development by dreamscapes design group.